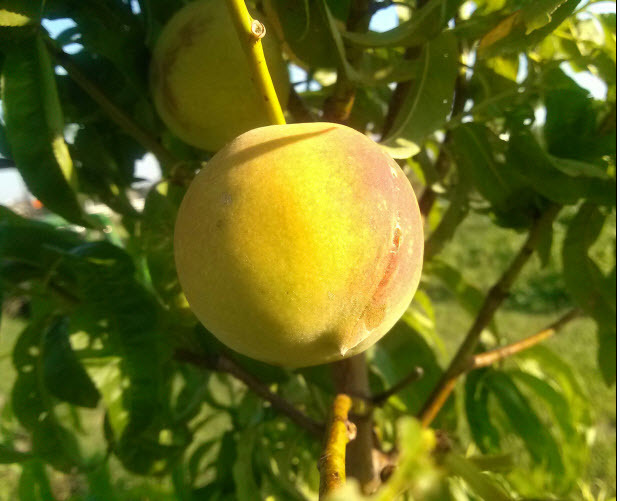 The peaches are just about ready to pick. This year, we planted two trees in April. The trees had already leafed out and bloomed shortly after planting. Over the course of the May frosts, about half of the peaches were destroyed, five survived. Peaches can be eaten fresh, frozen, or canned. The fresh peaches don’t last long — only a week or two–so if I have a lot of them, I will can them in jars because they last longer than frozen (I’ve used peaches up to 2 years after canning). Add peaches (fresh or canned, or any fruit) to Greek non-fat yogurt for a healthy breakfast with a variety of macronutrients AND low calorie!